The USGS track map for September 2014 is copied below (Fig. 1). At the end of September, with sea ice starting to rebuild, it appears there were 8 bears on the ice and three on land. 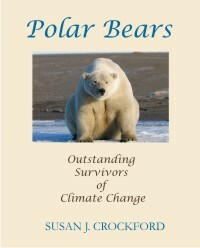 The situation for September was not very much different from August, except that two of the 11 bears (up from one) were on the ice in the Chukchi Sea in September, a phenomenon that was recently acknowledged to have affected the last population estimate for the Southern Beaufort subpopulation. Figure 1. 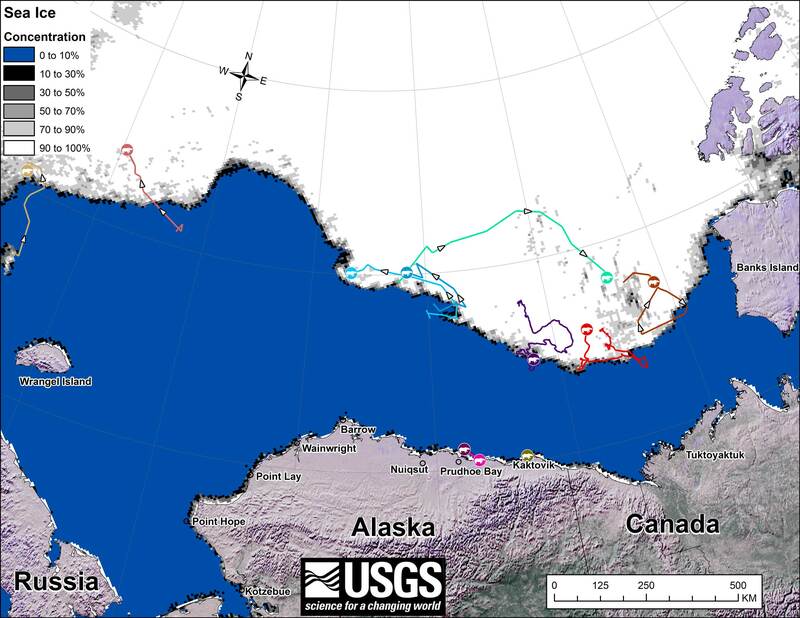 From original caption: “Movements of 12 [sic, actually 11] satellite-tagged polar bears for the month of September, 2014. Polar bears were tagged in 2014 on the spring-time sea ice of the southern Beaufort Sea. All twelve [sic, actually eleven] of these bears have satellite collar transmitters. 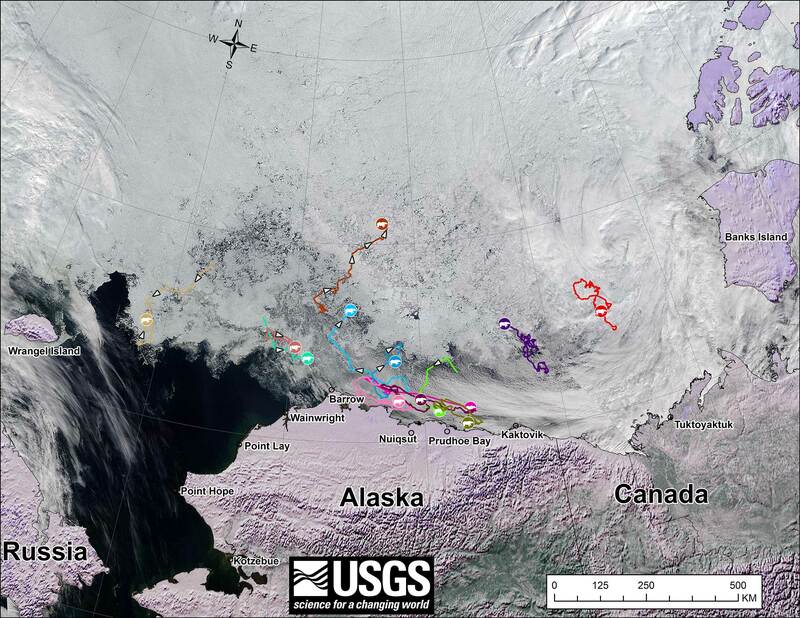 Polar bear satellite telemetry data are shown with AMSR2 remotely-sensed ice coverage for 30 September, 2014. AMSR2 data are made available by the University of Bremen.” Note that the dots with the polar bear icons are the end points (end September), while the other end of the string is their position in early September. Some of the apparent movement is due to the ice moving. Click to enlarge, original here. I count only 11 bear icons in Fig. 1, not 12 as stated in the original caption. Based on the fact that there were only 11 last month, I think twelve is simply a typo. Assuming that is the case, there were eight bears on the ice and three on land in September 2014. In other words, bears that wanted to be out hunting on the ice, could have been out hunting on the ice. As polar bears with collars are all females, these land-based bears may be pregnant and preparing to make their maternity dens onshore. One (olive green icons) may be feeding on whale carcasses at Kaktovik and two others (bright pink and burgundy icons) may be on their way to Kaktovik or simply resting near Prudhoe Bay. Two of the 11 bears (light brown and mustard yellow icons) were on the ice in the Chukchi Sea and therefore no longer within the boundaries of the Southern Beaufort where they were initially captured. This is a common occurrence for the Southern Beaufort and because of it, the Polar Bear Specialist Group plans to change the boundaries for this subpopulation. Compare this to July’s map (Fig. 2). The 20 bears from May (down to 13 in June) were down to 11. All seven of the bears outfitted with glue-on satellite transmitters in April [either males or subadult animals] have either moved out of the area or their tags have fallen off or stopped transmitting. This means that all of the bears shown on the maps here are females. Figure 2. From original caption: “Movements of 13 satellite-tagged polar bears for the month of July, 2014. Polar bears were tagged in 2014 on the spring-time sea ice of the southern Beaufort Sea. All thirteen of these bears have satellite collar transmitters. Polar bear satellite telemetry data are shown with MODIS imagery from 29 July, 2014.” Note that some of the white areas on the right (along Alaska coast) are clouds, not sea ice; only one bear was in the Chukchi Sea. 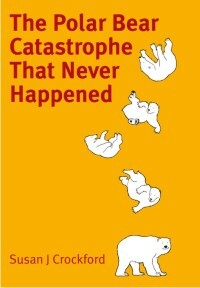 Click to enlarge, original image here. 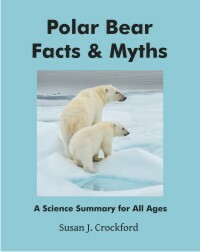 This entry was posted in Population, Sea ice habitat and tagged Alaska, Beaufort Sea, Chukchi Sea, Kaktovik, polar bear movements, polar bears, population estimate, Prudhoe Bay, satellite collars, sea ice, Southern Beaufort, tracking polar bears, USGS. Bookmark the permalink.